Consumer awareness of the purchasing of safe and eco-friendly apparel products is on the rise. 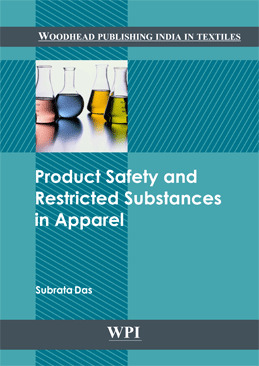 Knowledge of the restricted substances helps the industry navigate often complex product safety and chemical management requirements in order to address consumer preferences in the apparel supply chain. There is no doubt that risk analysis of the product at appropriate stage eliminates the possibilities of existence of restricted substances by adopting a right safety compliance policy. Thus, different safety aspects of apparel and its related requirements shall be covered in Product safety and restricted substances in apparel. Potential sources of restricted substances, chemicals of concern, and the scope of implementation for a proper testing program will also be discussed. Different standards to comply with legal regulations associated with the chemical management of restricted substances will be included in this book.